Background—The clinical utility of identifying pediatric metabolic syndrome (MetS) is controversial. This study sought to determine the status of pediatric MetS as a risk factor for adult subclinical atherosclerosis (carotid intima-media thickness [cIMT]) and type 2 diabetes mellitus (T2DM) and compare and contrast this prediction with its individual components. 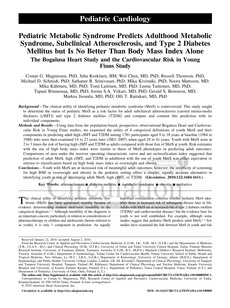 Methods and Results—Using data from the population-based, prospective, observational Bogalusa Heart and Cardiovascular Risk in Young Finns studies, we examined the utility of 4 categorical definitions of youth MetS and their components in predicting adult high cIMT and T2DM among 1781 participants aged 9 to 18 years at baseline (1984 to 1988) who were then examined 14 to 27 years later (2001–2007) when aged 24 to 41 years. Youth with MetS were at 2 to 3 times the risk of having high cIMT and T2DM as adults compared with those free of MetS at youth. Risk estimates with the use of high body mass index were similar to those of MetS phenotypes in predicting adult outcomes. Comparisons of area under the receiver operating characteristic curve and net reclassification index suggested that prediction of adult MetS, high cIMT, and T2DM in adulthood with the use of youth MetS was either equivalent or inferior to classification based on high body mass index or overweight and obesity. Conclusions—Youth with MetS are at increased risk of meaningful adult outcomes; however, the simplicity of screening for high BMI or overweight and obesity in the pediatric setting offers a simpler, equally accurate alternative to identifying youth at risk of developing adult MetS, high cIMT, or T2DM.